ALTERED OR NOT? These human embryos were edited with CRISPR/Cas9 to repair a gene that can cause heart failure. A follow-up study claims to confirm the result, but other scientists contend the embryos might not have been fixed. When researchers announced last year that they had edited human embryos to repair a damaged gene that can lead to heart failure, critics called the report into question. Now new evidence confirms that the gene editing was successful, reproductive and developmental biologist Shoukhrat Mitalipov and colleagues report August 8 in Nature. "All of our conclusions were basically right," Mitalipov, of Oregon Health & Science University in Portland, said during a news conference on August 6. But authors of two critiques published in the same issue of Nature say they still aren't convinced. At issue is the way that the gene was repaired. Mitalipov and colleagues used the molecular scissors CRISPR/Cas9 to cut a faulty version of a gene called MYBPC3 in sperm (SN: 9/2/17, p. 6). People who inherit this version of the gene often develop heart failure. Cutting the gene allows cells to fix the problem by replacing erroneous instructions in the gene with correct information. Researchers supplied the correct information in the form of small foreign pieces of DNA, but the embryos ignored that repair template. Instead, Mitalipov and colleagues say, embryos used a healthy version of the gene on the mother's chromosome to fix the error. That action is called gene conversion. Gene conversion typically happens when reproductive, or germline, cells swap DNA before making eggs and sperm. So it was completely unexpected to find that type of repair happening in embryos, says geneticist Paul Thomas of the South Australian Health & Medical Research Institute in Acton. If human embryos do ignore foreign bits of DNA that could be a problem for fixing genetic diseases that result when both parents pass on damaged versions of a gene. In that scenario, there would be no healthy version of the gene to copy and paste. But Thomas and colleagues propose that Mitalipov's group may not have detected gene conversion at all. Instead, large chunks may have been cut out of the chromosome containing the faulty version of the gene and not replaced. That wouldn't fix the defective gene, but could make it look like gene conversion had happened, fooling researchers into thinking they'd made a repair. Mitalipov's group used a technique called polymerase chain reaction, or PCR, to confirm that they had repaired the faulty copy of the gene. PCR essentially photocopied stretches of the repaired gene for analysis. 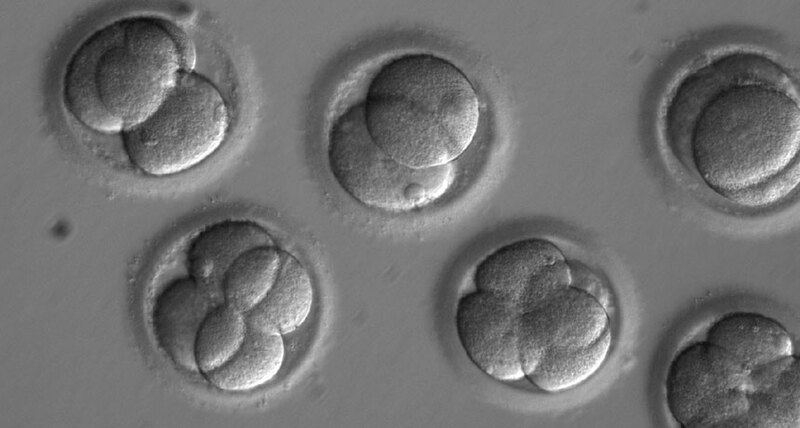 The team found that only the mother's version of the gene was in the edited embryos. That result led the researchers to conclude that gene conversion had copied the maternal version of the gene onto the father's chromosome. But because the researchers weren't able to take a closer look at the gene, they can't be sure it was gene conversion, Thomas says. Cutting out a portion of the father's gene would leave only the mother's version to be copied during PCR. That might give the impression that the father's gene was converted to the maternal form, when that piece of DNA is missing from the father's gene. Such large DNA deletions were common in experiments with mice, Thomas and colleagues say in one critique. About 45 to 57 percent of mouse embryos tested were missing big chunks of genetic material. But Mitalipov and colleagues didn't report finding any evidence that portions of DNA were deleted from the human embryos. "I find that surprising," Thomas says. He is skeptical that the data presented in the new report completely settle the problem. Rock solid evidence of gene correction was missing from Mitalipov's original report, agrees Maria Jasin, a developmental biologist at Memorial Sloan Kettering Cancer Center in New York City. The new report presents more convincing data, "but I'm still left with this doubt," says Jasin, a coauthor on the other critique. "I wouldn't rule out that gene conversion can happen" in such cases, she says. But in mouse experiments, that type of repair happens infrequently, she says, and there's no reason to suppose that human embryos do it more frequently. While there is optimism that scientists will be able to repair broken genes in human embryos, researchers aren't there yet, Jasin and Thomas say. Given all the things that might go wrong with gene editing, such as accidentally making mutations, there's no room for uncertainty about whether the technique works. "You have to be 100 percent confident," Thomas says, "and we're a long, long way from being in that position."